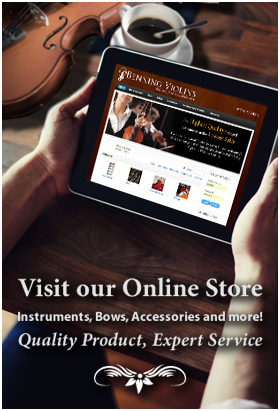 For the practicing instrumentalist, tuning a violin, viola or cello is a daily task. Located in the peg box towards the end of the instrument, pegs are adjusted to tune the pitches of each individual string. Fine tuners, optional tiny knobs located in the tailpiece, allow for more subtle adjustments in pitch, especially on steel-core strings. Each of the major stringed instruments (violins, violas, cellos and double basses) has their own traditional tuning. 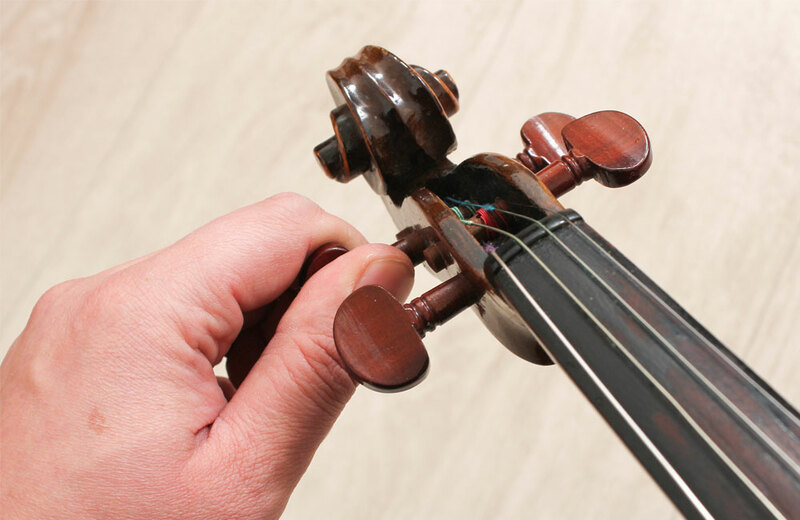 The violin is typically tuned so that the strings, when played “openly” or without any fingers touching the strings to the board, are G-D-A-E from left to right, or lowest to highest pitch. Traditionally the A-string is tuned to 440 Hz. The professional musician’s well-trained ear can detect ‘beating’ or the slight vibrations of sharpness or flatness, and make finer adjustments. Though the viola is similar to a violin in size and is positioned and played in a similar manner, it is slightly larger and tuned an entire fifth lower. The strings are typically tuned to C-G-D-A from the lowest to highest pitch. The cello has the same tuning configuration as the viola, except it is another octave lower. The upright bass is tuned so that the open strings are at intervals of fourths instead of fifths (E-A-D-G). It is the lowest in pitch of the stringed instruments. While these conventions of tuning are the most widely used, there are many alternative tunings. In Indian classical music, the violin is most often tuned to D♯-A♯-D♯-A♯, while in Arabic classical music the two highest strings (A and E) are lowered so that the configuration is G-D-G-D. In Iranian classical music, the two lowest strings are raised so that the configuration is A-E-A-E. In the Western classical tradition, scores by some major composers call for slight or major tuning adjustments.